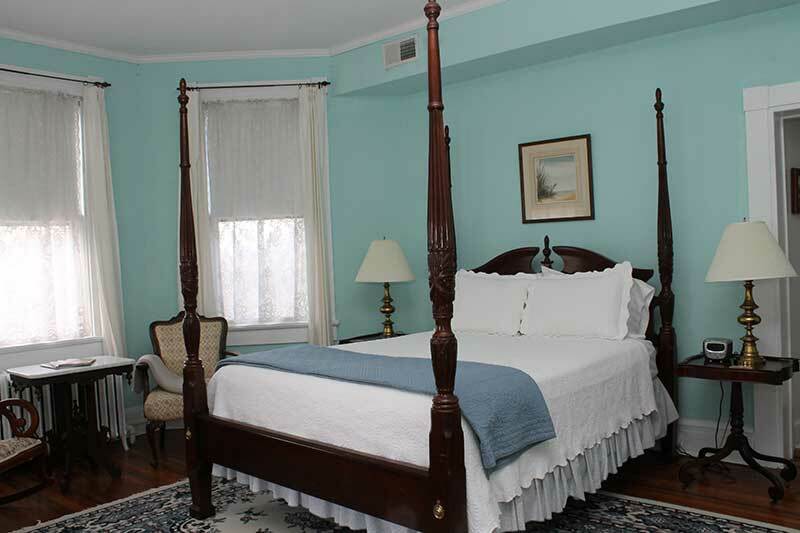 Located in the historic district of Cambridge, on Maryland’s Eastern Shore, this 1847 sea captain’s manor has six large guest rooms, uniquely decorated with period-style furnishings and each with its own private bath. After a restful night’s sleep, enjoy a delicious full breakfast overlooking the garden pond. Cambridge House B&B is a proud member of the Green Hotels Association. We employ eco-friendly practices as diligently as possible, including energy and water conservation, recycling, composting, and buying local/organic. And since Cambridge House is conveniently located within walking distance of the water, shops, restaurants, galleries, and museums – you’ll hardly need your car! For suggestions on outdoor activities, sights to see, and upcoming events, check out visitdorchester.org/see-and-do. Endless dining possibilities can be perused at visitdochester.org/eat-and-drink. Another great source of information is cambridgemainstreet.com. Our guests can enjoy a wonderful getaway filled with activity or just quiet relaxation. The choice is yours. 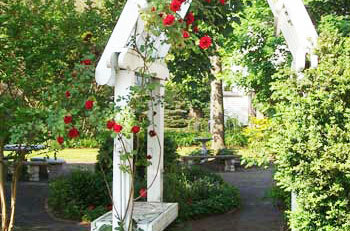 Cambridge House B&B is also the perfect setting for a bridal or baby shower. 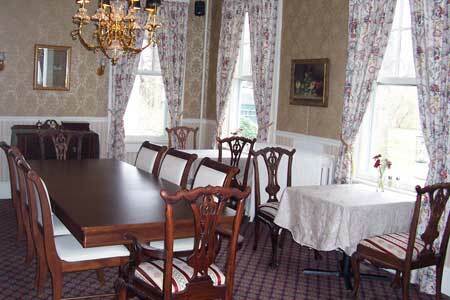 And we would be pleased to accommodate your business breakfast, lunch, or off-site retreat. 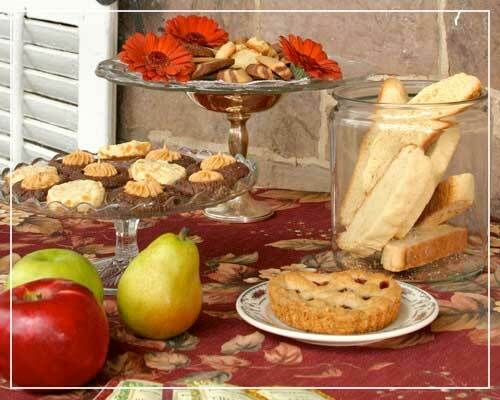 Eastern Shore hospitality and history, beauty and bounty await you at the Cambridge House Bed & Breakfast! 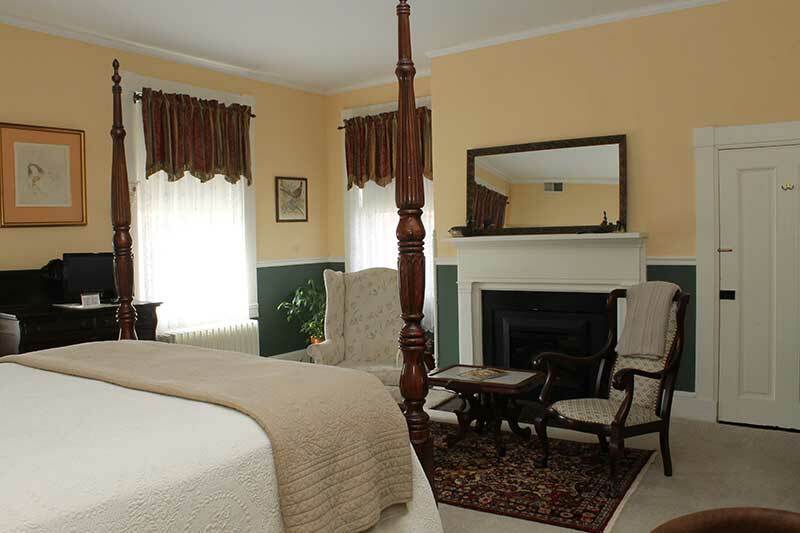 Our spacious guest rooms are named for the first six counties on the Eastern Shore of Maryland. 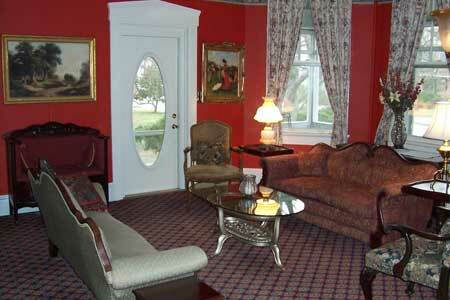 Each room has a private bath, cable TV, DVD player, clock radio, and hairdryer. Personal amenities include shampoo, conditioner, soap, lotion, and shower cap. 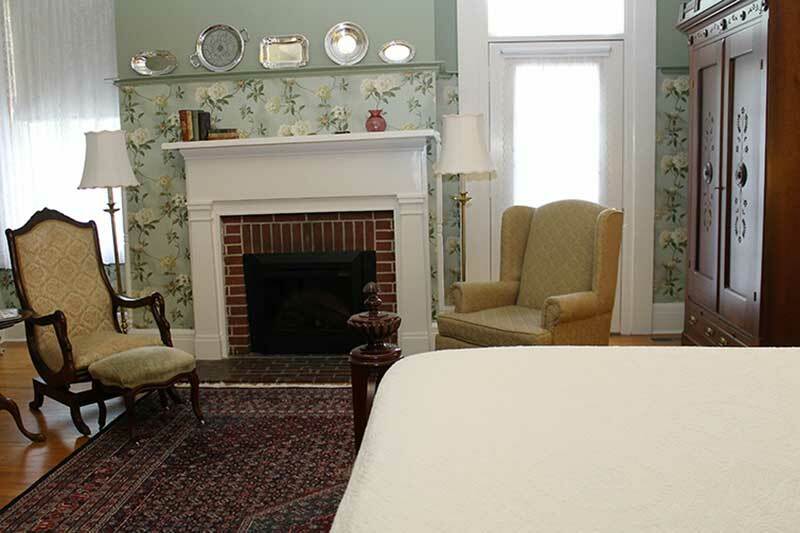 This first-floor guest room exudes comfortable charm with a queen-size bed, fireplace, private bath with shower, and access to the side porch. 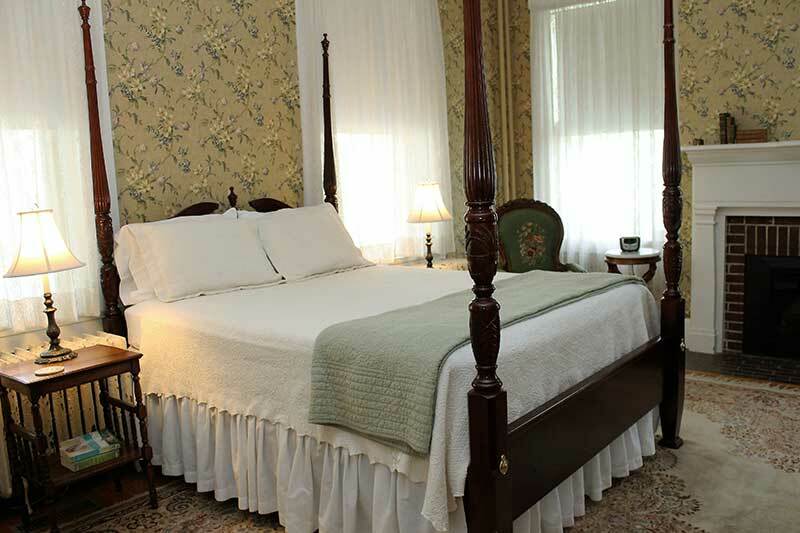 Conveniently located on the first level, this stately room includes a queen-size bed, full bath, fireplace, and access to the side porch. The classic décor features a king-size bed, fireplace, plush carpet, full bath, and access to the upper porch with water view. This room can be expanded into a suite with the addition of the adjoining “secret room” that includes a queen-size bed and half-bath. 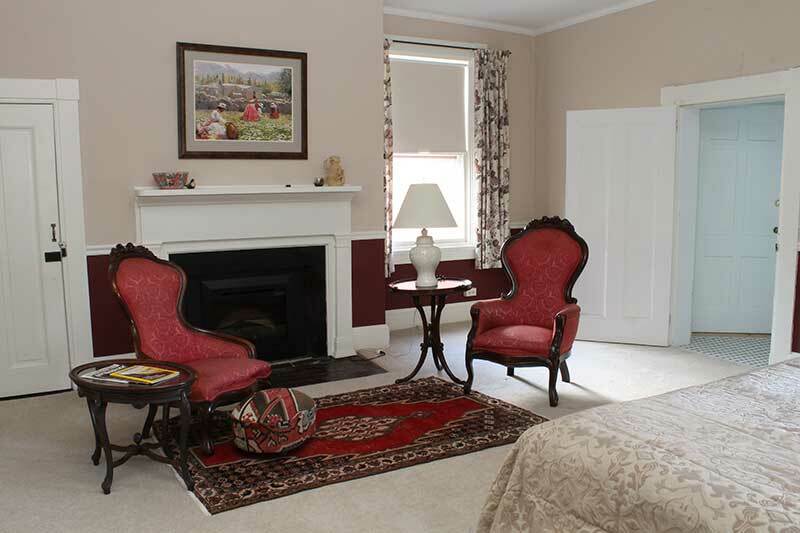 Read by the fireplace or enjoy the vista of historic High Street (and seasonal water view) from the large windows in this bright corner room with a queen-size bed, plush carpet, small desk, and private bath with shower. The bay window provides special charm in this bright and airy room that includes a queen-size bed and private bath with shower. The comfy chairs in front of the window provide the perfect spot for an afternoon of reading. 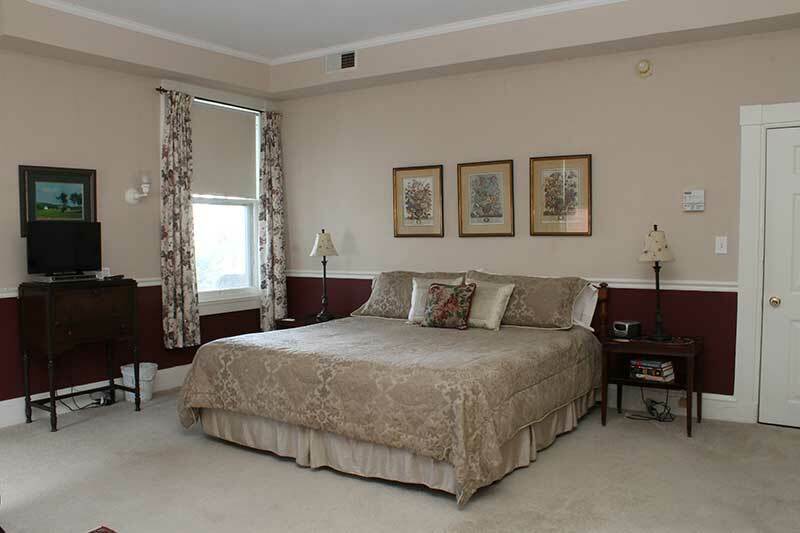 This romantic room offers a queen-size bed, large private bath with claw-foot tub and shower, private access to upper-level porch overlooking the gardens and Cambridge Creek. 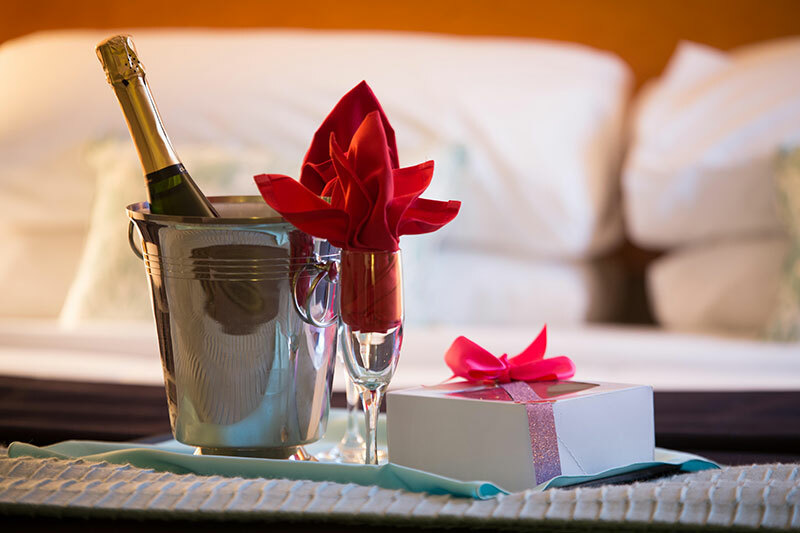 Snuggle into a cozy guest room, where a vase of lovely flowers and a box of gourmet chocolates will be waiting. If you wish, we will also make a dinner reservation for you at a local restaurant. Take a look at the many possibilities at visitdorchester.org/eat-and-drink. Stroll along the wharf and through the historic district, then venture into the quaint downtown, where the shops are unique and the owners are friendly. Or, if quiet one-on-one time is all you need, just relax at the B&B. 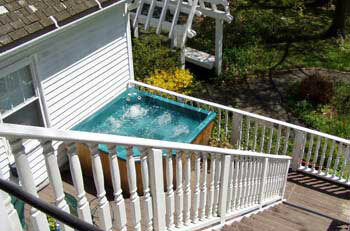 Bring your swimsuits and gaze at the stars from our outdoor hot tub. Enjoy a relaxing picnic for two in the park – or anywhere you choose. We’ll put together a basket filled with a French baguette, gourmet cheeses, fruit, dessert, and sparkling water. You just bring your appetite! 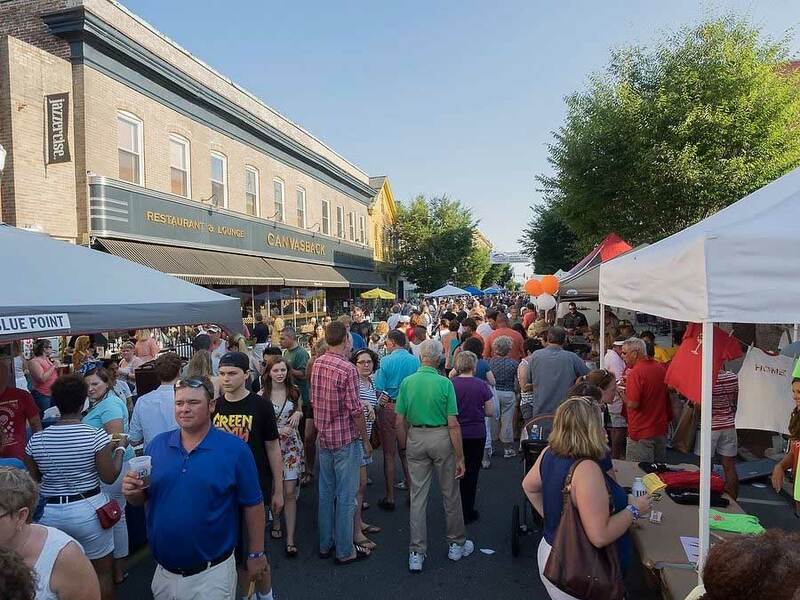 For a complete listing of upcoming events, visit Cambridge Main Street and Dorchester County Office of Tourism. 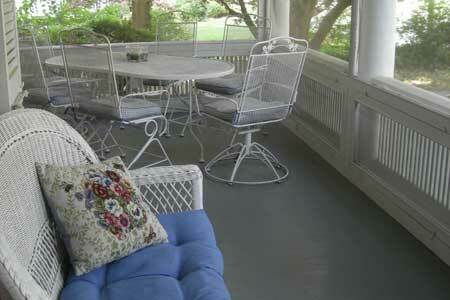 The parlor offers a comfortable gathering place with a great view of historic High Street. Enjoy a delicious full breakfast at a table for two overlooking the pond or at the main table chatting with other guests. Stroll through the gardens along the pebble paths as the sun rises on the Choptank River. The boxwoods are said to be over 100 years old. 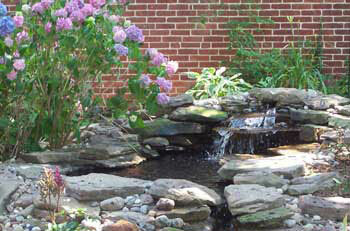 Enjoy the pond as you stroll through the garden or from your breakfast table in the dining room. Cap off a romantic evening gazing into the night sky from the hot tub. 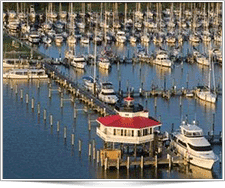 Long Wharf Park and Marina is located just one block from the Inn, where guests can dock their boat, enjoy a picnic, fish off the pier, or enjoy a sail on the Skipjack Nathan. Wake up to a beautiful sunrise on the water. 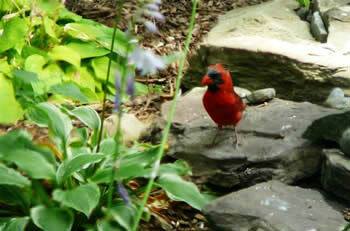 Enjoy birdwatching from the breakfast table. 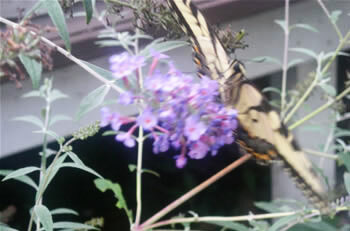 Follow the butterflies through the backyard gardens. 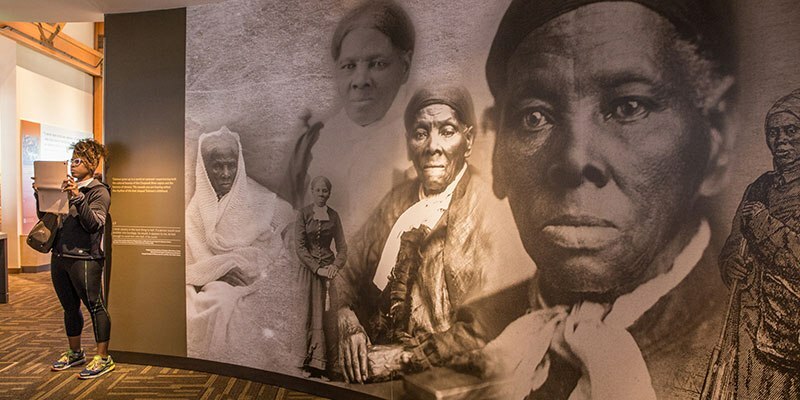 Did you know our area is affiliated with several notable historical figures, such as Harriet Tubman, Frederick Douglass, Annie Oakley, Bea Arthur (“Golden Girls” & “Maude”), and author James Michener, who chose our waterways for the basis of his classic, “Chesapeake”. Enjoy the Many Attractions of Cambridge! Enjoy a Historic Guided Tour of Cambridge, and learn about old houses, history, and great stories in this beautiful seaside community. 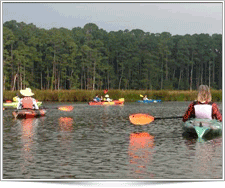 Hike, Bike, or Kayak exploring Blackwater National Wildlife Refuge, a haven for over a hundred Bald Eagles. 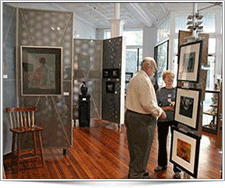 Take a workshop at the Dorchester Arts Center or visit the beautiful gallery and gift shop. 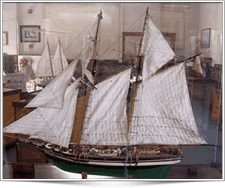 Visit the Richardson Maritime Museum: named after the sailboat captain who escorted author James Michener when researching his novel, Chesapeake. 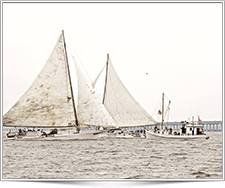 Sail aboard the authentic Skipjack Nathan – hear stories of the working watermen and dredge for oysters. 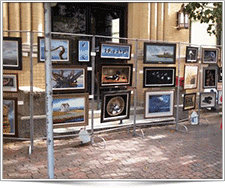 Enjoy our charming downtown galleries and specialty shops, such as The Wine Bar (wine, cheese & chocolate! ), Sugar Magnolia, and The Fibre Cafe yarn shop. 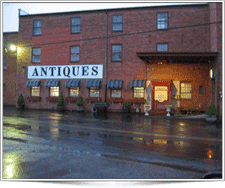 Go treasure hunting at the many antique shops in and around Cambridge. Ask us for an up-to-date list of local shops. Dine at delicious restaurants, such as Snapper’s Waterfront Café, Bistro Poplar, Suicide Bridge Restaurant, Canvasback Restaurant and Pub, Portside Seafood Restaurant, and Jimmie & Sook’s. Enjoy freshly steamed and spiced Maryland crabs at Ocean Odyssey, or pick up a bushel right behind our house at J.M. 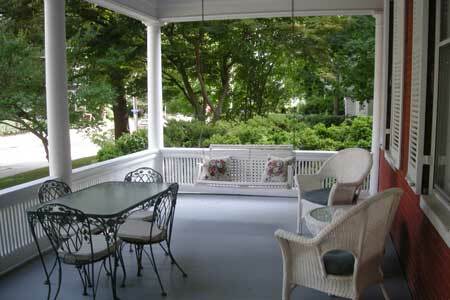 Clayton’s to enjoy on our porch! 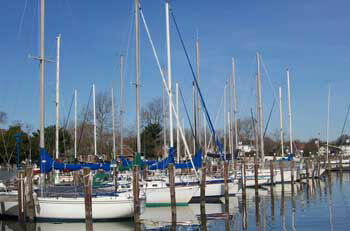 Dock your boat at the Municipal Yacht Basin at Long Wharf just one block from Cambridge House. 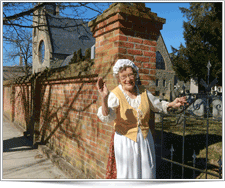 For more information on these and other attractions in Cambridge and greater Dorchester County, visit tourdorchester.org. Check-in is available from 3:00 PM to 7:00 PM, unless special arrangements have been made in advance. Check-out is not later than 11:00 AM. Full, multi-course breakfasts are served in the dining room each morning from 8:30 AM until 9:30 AM. Afternoon refreshments are also provided. Please advise at the time of reservation if you have any dietary restrictions. Cambridge House is a SMOKE-FREE inn. This also means no candles, incense, or anything else requiring a flame. 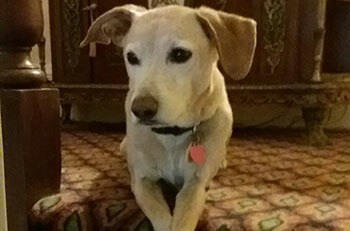 We appreciate your help in keeping the inn and all its occupants safe and sound. Room rates assume double occupancy and do not include the 5% Dorchester County lodging tax and the 6% Maryland state sales tax. If there are more than two individuals in a room, the additional guests will be charged $50 each. We recognize that plans can change, so please note our CANCELLATION POLICY. Regardless of the reason, cancellations received fewer than 15 days prior to the reservation date will be charged the full amount of the anticipated stay. For holidays, multiple room bookings, or special events such as Eagleman or Ironman Maryland, cancellations must be made 30 or more days prior to the reservation date or be subject to a charge for the full amount of the scheduled stay. In any case, there is a cancellation fee of $25. Cancellations must receive a cancellation number, without which they are not valid. Sorry, no exceptions. If you have concerns about an unexpected emergency, we encourage you to look into travel insurance from Travel Guard or other reputable companies. 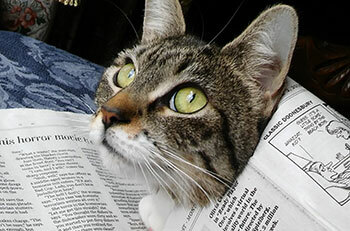 Pet Policy: Though we have our dog Max and cat Miniña, we do not permit guests to bring pets. Our own pets are strictly prohibited from entering guest rooms, and we cannot allow other pets in the guest rooms either. Children: We do not encourage guests with children at the Cambridge House and Breakfast. 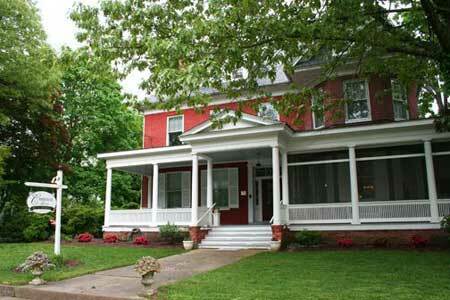 The inn is an old house furnished with many antiques, and does not lend itself to a comfortable visit with children. 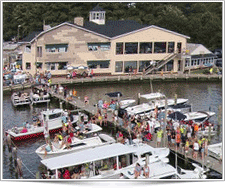 Our goal is to provide a wonderful experience in the desirable location of Cambridge, MD. We strive to create an environment that is welcoming and accommodating for all individuals, including those with hearing, vision or other disabilities. If you have difficulty navigating our website or booking a room at our hotel, we ask you to contact us via telephone or email and our helpful staff will be happy to assist you. We work very hard to provide an easy-to-use online experience for all guests. We believe all of our website visitors should be able to easily research online on https://www.cambridgehousebandb.com regardless of device type and whether an individual requires assistive technology like a screen reader, font magnification, translation or voice recognition software. Our hotel website allows visitors to search for accessibility featured guest rooms with ease and details our property’s accessibility features here. 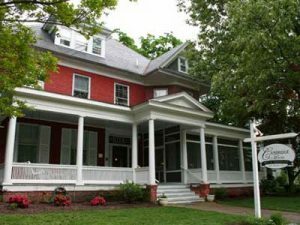 At The Cambridge House Bed and Breakfast, we are dedicated to protecting your privacy and safeguarding your personally identifiable information. 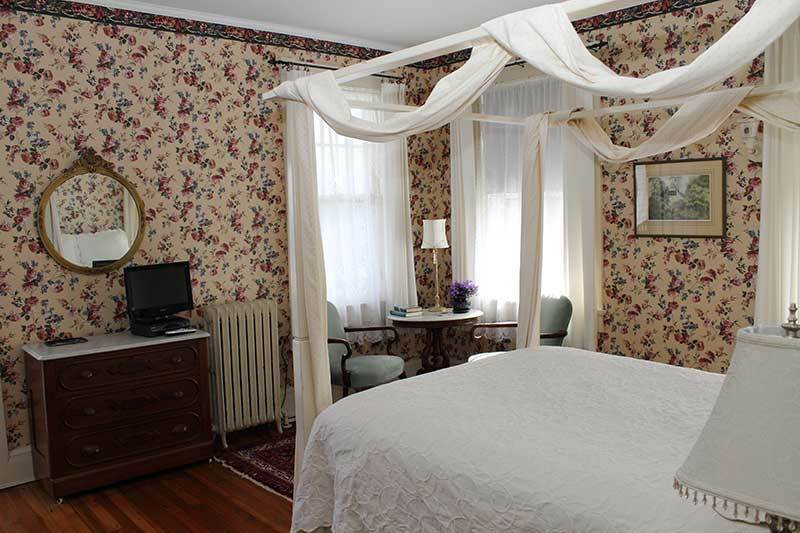 Our main purpose in collecting your personal information is to provide you with a streamlined experience in making reservations at The Cambridge House Bed and Breakfast. We only collect information about you that we consider necessary for achieving this. Personally identifiable information is only obtained when making a reservation. All identifiable information provided will not be disclosed to anyone unless we are specifically requested to do so. 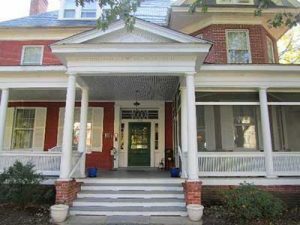 The Cambridge House Bed and Breakfast does not give or sell to anyone any information we collect on our site. At The Cambridge House Bed and Breakfast, we take security seriously. When users make a reservation we use every precaution to safe guard it online and offline. 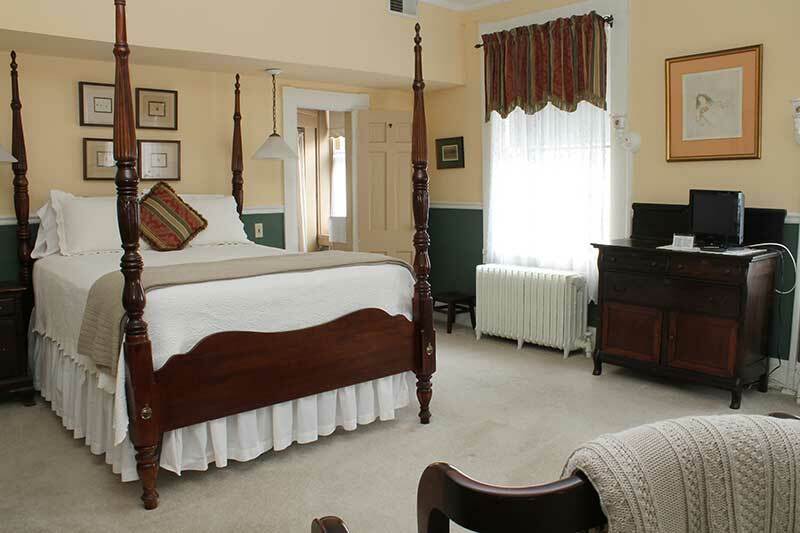 The Cambridge House Bed and Breakfast may amend this Privacy Statement from time to time in order to meet changes in the regulatory environment, business needs, or to satisfy the needs of our guests, properties, strategic marketing partners, and service providers. Our Property has been grandfathered in to previous legislation and is not physically equipped to handle handicapped persons. Optimize the way you view your web browser. If you have difficulty in reading our website on your screen, you may be able to change the settings on your browser to help you improve readability and visibility of each webpage. Fill out the form below with any questions, comments, or concerns and we’ll get back to you right away. 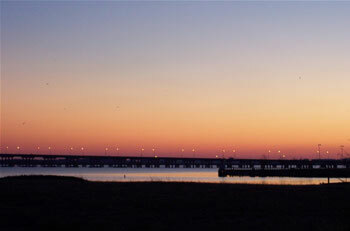 Interstate 95 South to 13 South (shore points south) across the Christmas tree bridge (canal bridge) to 896 West. Go 4 mile to 301 South. 5 miles past the Visitor Center take 213 West to 50 South. 27 miles to Cambridge. Turn right at the first light after crossing the Choptank River (Maryland Ave.) crossover drawbridge make first right (Academy St.) at second light turn right onto High St. we are at the corner of High St. and Commerce St. (one block from the wharf).